Vote counts Tuesday night once again showed how Texas is a red state. 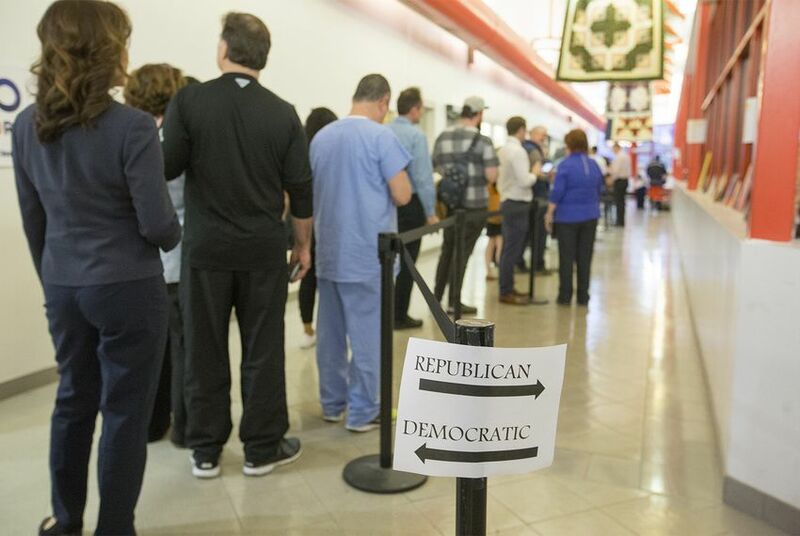 Despite an apparent early rush to the polls for Democrats, Republicans ended up casting more ballots in the 2018 primaries. Texas Democrats were hoping for a "blue wave" Tuesday night; instead, voters from both parties raced to the polls — and the minority party in the state fell short of the GOP in the vote tally once again. If you looked at early voting numbers, you might have thought Democrats had an edge. More than 650,000 people voted early in the 10 counties with the most registered voters. More than 370,000 of those were Democrats, compared to nearly 283,000 Republicans. Four years earlier, Republicans outvoted Democrats in early voting in those 10 counties. So going into Tuesday night, it seemed like the Democrats might be on track to hustle more people to the polls. Election night returns told a different story. "We have been hearing for weeks in Texas and across the country that a great 'blue wave' was coming to Texas," Lt. Gov. Dan Patrick said in a Wednesday news release. "But the votes have been counted and we know that so-called 'blue wave' never made landfall." All isn’t lost for Democrats as they prepare for the November general election, however. Enthusiasm in the party still seems up. In total, Democratic primary turnout more than doubled from 2014 to 2018. The rise in Democratic turnout might be attributed to the several contested congressional races where the minority party hoped to flip districts that Hillary Clinton won in 2016 but that are currently held by Republicans. One of the most hotly contested races was in Congressional District 7, where seven Democrats fought in a bitter primary battle to take on U.S. Rep. John Culberson, R-Houston. The race drew national attention after the Democratic Congressional Campaign Committee released opposition research about one of the Democratic candidates, journalist and activist Laura Moser, saying she was too liberal to defeat the Republican incumbent. Despite national Democrats’ efforts, however, Moser came in second and will face a primary runoff against attorney Lizzie Pannill Fletcher, who led the crowded Democratic field with nearly 30 percent of the vote. Another seat Democrats are hoping to flip in November is Congressional District 23 — a swing district held by Republican Will Hurd, R-Helotes. As of Wednesday morning, retired Air Force intelligence officer Gina Ortiz Jones led the race with 40 percent of the vote. With all precincts reporting, Rick Treviño, a high school teacher, appeared poised to challenge Jones in the May runoff. However, his 216-vote margin over Judy Canales, who served in the U.S. Department of Agriculture under President Barack Obama, leaves open the possibility of a recount. In Texas’ 32nd Congressional District in Dallas, seven Democrats competed to face U.S. Rep. Pete Sessions, R-Dallas. The two Democratic frontrunners, former NFL football player Colin Allred and former Obama administration official Lillian Salerno, will now face off in a primary.